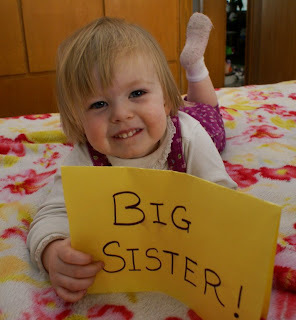 I told Juliana, "We have something exciting to tell you!" She looked appropriately excited and asked, "Is it a present?!" It will be like a present, arriving awfully close to her birthday and all, but we'll have to wait and see how excited she actually is. Come September (Juliana's third birthday give or take a few days) Juliana is going to become a big sister. 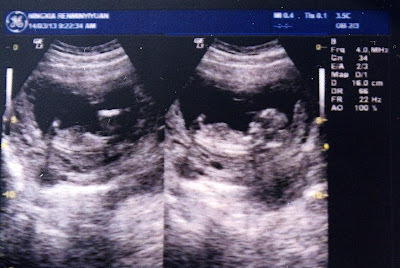 We had our first appointment in Thailand where we got to see the baby for the first time. When we went into the hospital Kevin told Juliana, "We are going to find out about your baby brother or sister." 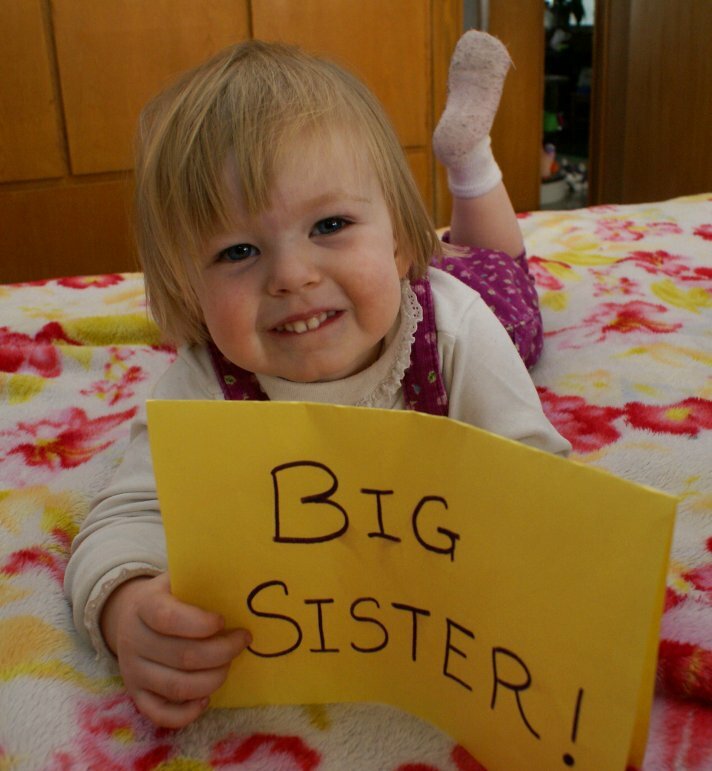 Juliana said, "We're going to find a baby brother or sister!" Then spotting a young girl she cried out, "There's a sister!" We have reason to believe she doesn't really understand how this works. We are excited, particularly in the moments when I've not been violently ill. Pregnancy has not been super kind to me thus far. I was sick with Juliana, but I have been much sicker this time. I have figured out why they call it morning sickness - one morning you wake up feeling really sick...and then it never goes away. This week I have seen a little improvement though. I've started to make it through some days without thowing up - a wonderful feeling. I've even been able to do some things like take a shower and do some laundry without feeling sick! I have also been managing to go to class every day, though I can't say a lot for the study outside of class. It's funny, but studying Chinese doesn't seem to help the nausea. I am also hesitantly venturing beyond my 4 safe foods: eggs, bread, cheese, and milk. Today I actually made and ate spaghetti! 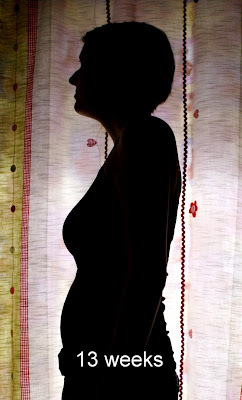 Unfortunately this pregnancy, I can't handle Chinese food at all. Even the smell is completely sickening. This is really a problem when you live in China. Kevin is having a hard time with food too, mainly because I haven't been cooking anything. Fortunately there is a lot of take-out available. Unfortunately it is all Chinese. I hide in the bedroom while he eats and then burns candles and fans out the room. I don't know if you've noticed, but Chinese food SMELLS. I'm really looking forward to feeling like a mostly normal person again because these past couple of months have been pretty miserable. I think I'm starting to turn a corner though. After losing 6+ pounds, this is the first week I have actually gained back weight! It's not often in life you get to be really happy about that. And in case you were wondering, yes, we will buy Juliana a real birthday present as well. It felt like I was eating a science experiment. I'd bought the box of rice topped with a common Chinese pork dish called 鱼香肉丝 （Yu Xiang Rou Si) on a whim last time I went to the grocery store. 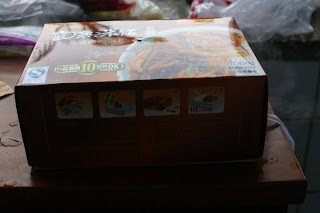 I thought it might make a quick microwave meal some night when we didn't feel like going out or cooking something else. I figured -- I'd eaten halfway decent Chinese TV dinners in the States many times. Undoubtedly the Chinese could do a better job of it. And I'd never even seen a Chinese TV dinner before in China, I should give it a try. But this was a TV dinner without the microwave. Place the lid back on, pull the tape until the red label. Wait for 10minutes and enjoy your delicious meal. Ensure the lid is tightly closed when pulling the tape. Beware of hot steam during the heating process. It is normal for the lid to rise by approximately 2-3cm while heating. Do not attempt to remove lid during the 10mintue heating process. Adult supervision is required for children. Please wait for 15 minutes in the elevation of 3,500 meter above area. Thankfully the Chinese cleared up some of the punctuation omissions. It also helped me figure out exactly what the "dish bag," "wet tissue," "parafilm" and "3,500 meter above area" were. The "dish bag" was the sealed bag containing the main dish (food) to be spread atop the rice. The "wet tissue" is a handy pre-wrapped napkin so you can wipe your hands after eating (it wasn't wet). The parafilm was the cellophane wrapper. And "3,500 meters above area" refers to elevation -- almost 11,500 feet above sea level (For perspective -- that's about the altitude of Lhasa in Tibet, where altitude sickness is a common problem for visiting travelers, higher than the peak of any of the mountains in the range near Los Angeles. I guess that mountain climbers are envisioned among their clientele). I pulled everything out and looked at it, tearing open the cellophane and dutifully pouring the contents of the "dish bag" onto the rice. 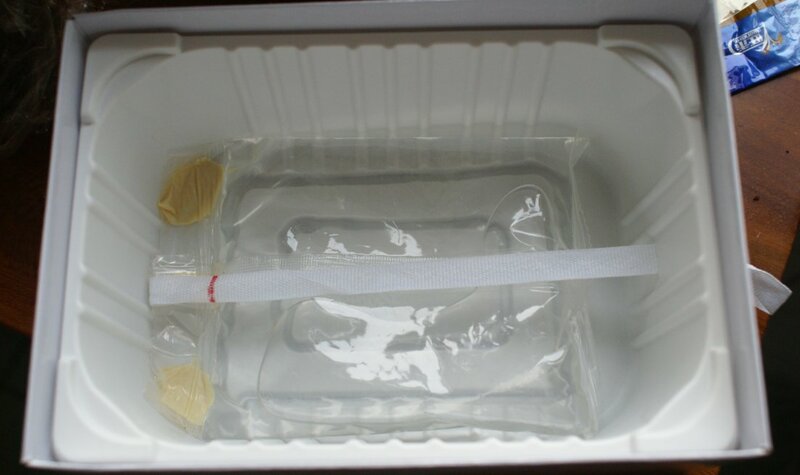 Inside the box, underneath the rice tray, was a napkin-wrapped cloth bag containing a powdery substance lying atop a bag of a liquid substance (water perhaps) with a string running across it and outside of the box. I shoved everything back into the box as if I hadn't done anything to it and tugged (hard) on the string, releasing the water into the bottom of the box, uncertain what exactly I should expect. Amazingly, within a minute, the box began to get warm and a chemical-scented steam began pouring out of the ventilation holes in the top and sides of the box. It was working. Then I remembered those chemical hand-warmers I used a couple times watching high school football games on cold November nights in the States. It must be a similar idea. The chemical smell, however, made me open the window and wonder: is it safe to eat food cooked over a pool of chemicals? It felt like something we would have done in our high school chemistry class. Something that might end in an explosion. I waited the 10 minutes it suggested to cook it, then remembered that Yinchuan is at about 3,000 feet above sea level. A big difference from 3,000 meters, I know, but it seemed like longer would probably help. I Googled "self-heating food" and discovered an article from The Guarding titled "Is self- heating the future?" In addition to emergency workers, the author writes, "There should be a market for good self-heating food – for mountaineers, campers and explorers, for luckless fishermen, isolated cottages, power cuts and for the impending global apocalypse. There's a market for it, and nobody's cracked it yet." I also found a Wikipedia article and some companies in the States selling them. They point to FDA claims that they're safe. OK. 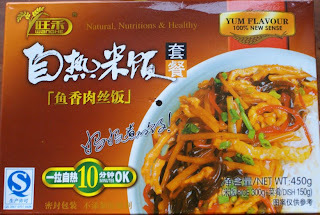 So I pulled the box open and crossed my fingers that the Chinese company is using the heating method approved by the FDA, or at least that the Chinese food safety label on the front of the box means something. There was steam and the food was mostly hot. I poured it onto a plate and stirred it up, but the rice kinda stuck together in semi-hard clumps. I took a deep breath and took a bite. It wasn't terrible. But it was too cold and the rice needed more steaming. I threw it in the microwave for another minute in hopes of softening up the rice. It worked. But it wasn't something I'd purposely eat again, either. The "Yum Flavor" claimed on the cover? Not so much. "100% New Sense." Sure. 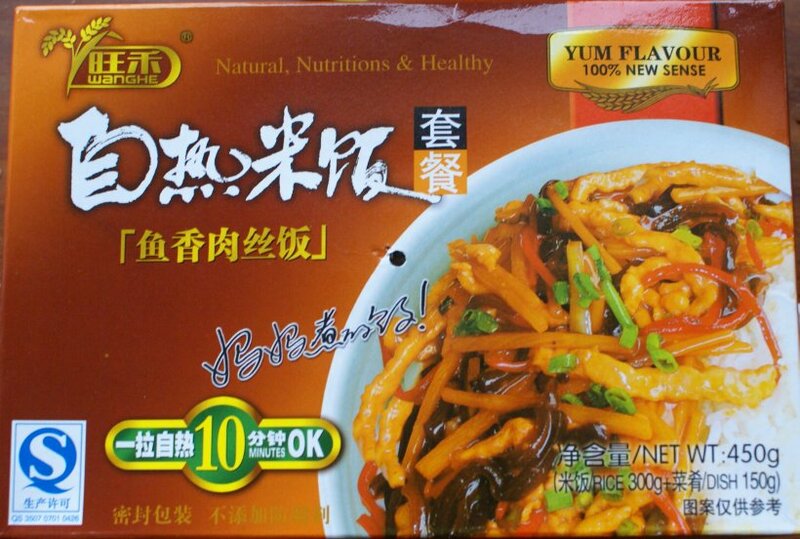 If it actually tasted, um, good, it seems like it might appeal to college kids who don't want to go out to eat, since Chinese students aren't allowed to have any sort of cooking equipment in their dorm rooms. However, the 30 RMB price-tag (about $4.75) seems prohibitive. The school cafeteria makes the same dish better at about 1/4 the price. Plenty of local restaurants make it actually taste good better for about half the price). I found a website from the company (旺禾) with a video demonstrating the heating process. I notice on the page, they also provide microwave instructions. Might be handy to have those on the box, but then again, maybe anyone who buys this is just buying it for the novelty.